The Hifdh Class course is a full-time study programme for those who wish to make a commitment to memorising the Glorious Quran. The likeness of the one who reads Quraan and memorizes it is that he is with the righteous honourable scribes. The likeness of the one who reads it and tries hard to memorize it even though it is difficult for him, he will have (at least) a double reward. 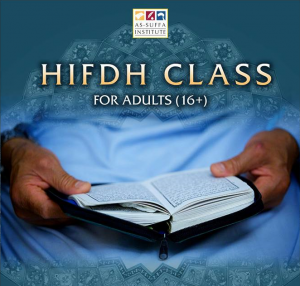 The Hifdh Class course is a full-time study program for those who wish to make a commitment to memorising the Glorious Quran. This full-time course will provide a structured and regular opportunity to sit down and memorise parts of the Qur`an under the supervision of a senior qualified Tajweed teacher with many years of experience.